Does your online presence clearly speak what you intend to potential clients? Would you like a clear, step-by-step, action plan to bring your website into balance with the soul of your business? Would you like to attract more clients and customers who resonate with what you do? Does your website clearly communicate who you are—and what sets you apart? Does your website project a professional image that invites others to spread the word about your work? You have a website because you already know that your online image is critical to the lifeblood of your business. Let's ensure that the site you have is connecting you with the people who make your heart sing and your energy soar! Some of my assessment clients have created their own sites, often listening to ideas from friends, pulling in tips from coaches, using site templates that are simple enough, with a result that is often a mishmash that doesn’t bring pleasure or inspire potential clients. Even the sites created by professional web developers may fall short, because they bring forth all the technical expertise they have, and yet the result lacks energetic flow or is so heavy on the marketing tools that the spirit of your intentions for your clients is missing. I draw upon 20+ years of experience working with the various platforms of online presence, including social media. I help my clients sort, assess and prioritize where they need to have a presence in order to have the greatest impact. Though my years of building websites, I've gained extensive knowledge of the behind-the-scenes technical coding involved in creating effective websites. My graphic design skills and years of business photography are the creative elements that serve to design and develop a clear, yet artistic, visual depiction for communication with clients through design features that encourage site visitors to explore and peruse. I also have the ability to translate the "mystery" of online business and commerce for even the lay business person, in a supportive and non-judgmental way. 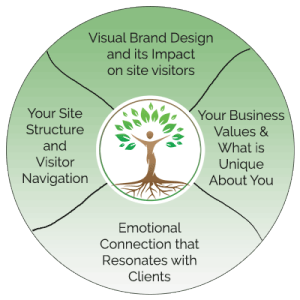 How can a Clarify Your Vision Website Assessment help your online presence? What will the Clarify Your Vision Website Assessment Provide for You? In addition to describing the balance of the elements above (or lack of balance) on your current primary site, you will receive actionable recommendations for changes that will bring your site into alignment with your goals. This is perfect for the DIY entrepreneur who maintains their own site, as well as the person who delegates to someone else for marketing and site maintenance. Click the button below to fill out the introductory survey. This gives me the information I need to create an action plan for your site. I'll contact you via email to set up an initial phone consult first, to review your survey and get clear on whether we are a right fit to work together. Once we are good to go, we'll book the date when I'll do the assessment (you'll want to be available that day for any clarifying questions I might have) and you'll pay the $297 fee to hold that week.